On the eve of the 2013 Oscars, Hollywood has done itself a solid by not launching any films that are likely to upstage the ceremony with a giant box office story. I mean, that was the plan, right guys? In fact, neither of the two new wide releases is all that likely to even open at the #1 spot against returning films. 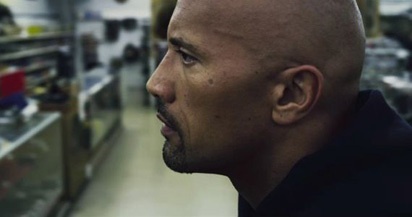 Snitch has the best chance of accomplishing that, with its action-heavy plot and the presence of one Dwayne Johnson. The Actor Intermittently Known As The Rock plays a trucker who goes undercover with the DEA in order to win his son's freedom, after he's arrested as part of a drug sting. Look, all you've got to do is to take down the Florida Mob from the inside, right? No biggie. As we've seen recently, non-tentpole action has been a tough sell, even with supposed big names in the genre. Even Die Hard 5 was kind of a disappointment in that department. Snitch unfortunately does not look that special in that “gotta see it!” way, even if it does try to make a bit of a connection with the Fast & Furious franchise by having him drive vehicles fast in destructive ways. Of course, that formula didn't work all that well for him in Faster, even if it was before his appearance in Fast & Furious. Really, if you look back through his recent career, Johnson's big returns only come from franchise films, adaptations or supporting roles in comedies. Snitch is none of these, and without a big push from the studio or a big name director, this is going to wind up as yet another lower-tier action film in the early part of this year. I'd look for about $11 million. The other new film this week, Dark Skies, appears to be seeing just how far “from the producer of Paranormal Activity” can be pushed as a tagline. Keri Russell and Josh Hamilton star as suburban parents who discover that they've been targeted by a supernatural entity for possession, which is apparently foretold by birds crashing into windows and staring into space for hours at a time. The film's premise seems to suggest a hint of randomness and inevitability about the whole thing, making it perhaps a bit pointless and anti-climactic as film. A film with close to the same pedigree, Insidious, opened to about $18 million last fall, but I feel like Dark Skies is lacking in both the promotional department and in actual scary imagery. It's mostly just Russell staring wide-eyed with her mouth covered and shadowy things moving just out of frame. While I know horror film fans are generally undiscerning these days, I'm not sure this one passes the same test as the other more successful horror films of late. I look for an opening weekend of about $9 million.